This is a story of one of the simplest dishes having the most impact. 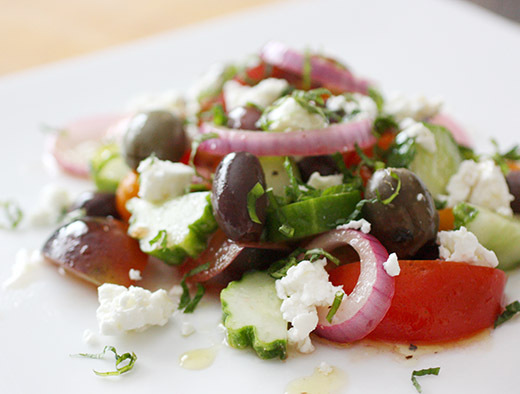 I have this memory of a Greek Salad that I ordered at a restaurant in Palm Desert during one of our trips there. It was my favorite thing I ate that entire trip. Tomatoes, cucumbers, olives, and feta makes for such a simple combination that it’s weird that I even remember it. But, it was perfect. When I read my review copy of A Girl and Her Greens , I found myself nodding in agreement with April Bloomfield’s description of her Greek Salad. It starts with fresh, ripe tomatoes and cucumbers, and I have a little thing about fresh cucumbers. Just like tomatoes, farm-fresh, just-picked cucumbers have so much more flavor than anything from the grocery store. And, I love bringing home different varieties of cucumbers. I found two types of cucumbers and several types of tomatoes at Boggy Creek Farm including the red and purple Indigo Rose tomatoes. 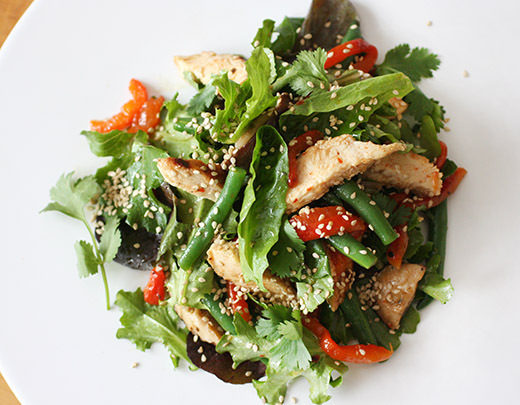 After you gather the best of those two ingredients, Bloomfield suggests you take the time to cut them into different shapes to make the salad more interesting. Then, those chopped pieces get refrigerated to get them nice and cold. She marinates the onions in vinegar and oil for a few minutes. These little details along with carefully choosing the type of olives and using a good goat feta make this simple salad great. Thoughtful considerations like these are found in all the recipes in the book. I did a similar nodding in agreement as I read the Eggplant Caponata and Piedmontese Peppers with Tomato, Basil, and Anchovy recipes. There’s nothing too difficult here but lots of smart techniques for delicious vegetable dishes. So, to make this salad, the chopped cucumbers and tomatoes were placed in separate bowls and refrigerated for 30 minutes. That way, if juice from the tomatoes runs, it won’t get the cucumbers soggy. While those chilled, I sliced red onion into rounds and marinated them in Banyuls vinegar with extra virgin olive oil and a little salt. Separately, a vinaigrette was made with lemon juice, salt, and olive oil. Once the cucumbers and tomatoes were chilled, they were combined, the lemon vinaigrette was poured over them, and they were gently tossed. There’s mint in this version of the salad, and I’m lucky to have mint growing in front of our rented, temporary home that I can use. I have my own basil in pots, but everyone knows I’m incapable of growing mint myself. I used both herbs in the salad. For olives, Bloomfield uses pitted Nicoise. I like Nicoise olives fine, but meaty Greek olives are my favorites. I used some of both. And, I used our locally made Pure Luck goat feta. 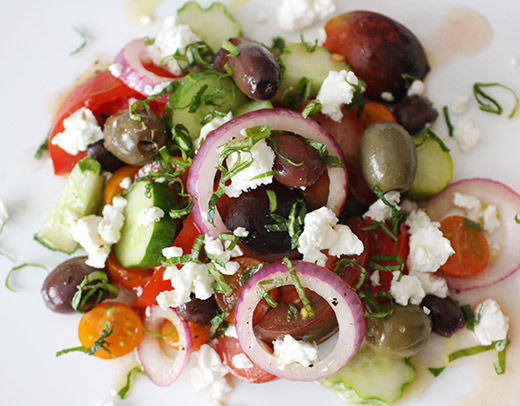 To serve the salad, the cucumbers and tomatoes were placed on a plate, the onions were set on top, olives were scattered about with the mint and basil, and feta was crumbled over everything. Last, the remaining liquid from the bowl with the onions was drizzled over the salad. 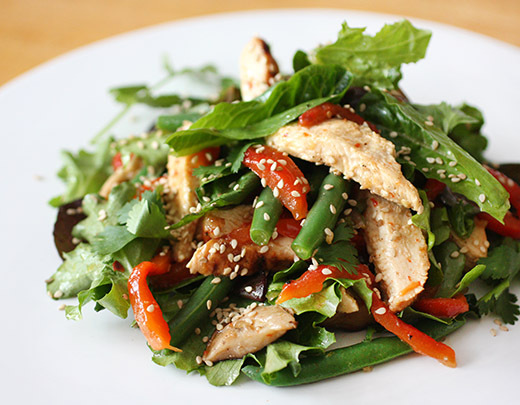 Taking care with each step of this salad made it wonderful. The service wasn’t nearly as good as what I remember when I ordered that Greek Salad in Palm Desert and the view from the dining table this time didn’t compare at all, but the flavors, textures, and freshness were just as good if not better. Next up from this book, I have to try a very similar salad that becomes a sandwich filling on thick, white bread. It even inspired me to bake the bread myself. Tomato season is in full swing here in Austin, and I’ve been bringing home as many as the two of us can consume. A tomato is possibly the easiest type of produce to put to good use in the kitchen, but I had no idea that the leaves of the plant can be used as well. I received a review copy of the new book The CSA Cookbook by Linda Ly and learned about eating tomato leaves and a few other ways to use even more of edible plants. The goal of the book is to share ideas for using every bit of what shows up in a CSA box including the less popular vegetables. But, it’s also a great reference for gardeners who have entire plants at their disposal. I’ve eaten sweet potato leaves when they show up in our CSA in late summer, but I didn’t know leaves from pepper plants are edible too. And, entire squash plants are edible from the vines and leaves to the blossoms, vegetables, and seeds. Now I want to grow my own so I can make Sicilian Squash Shoot Soup. There’s even a recipe for Quick-Pickled Sweet ‘N’ Spicy Radish Pods which appear after the plant flowers. Not all the recipes are for such unusual parts of the plant though. There’s also Rosemary-Roasted Carrots, Carrot Top Salsa, Green Onion Pancakes, and Fennel Apple and Celery Slaw to name a few. But, let’s get back to those tomato leaves. I’ve always loved the smell of tomato vines and leaves, and I couldn’t wait to try a pesto made with the leaves. We all know that I can’t grow tomatoes myself to save my life, but Springdale Farm was kind enough to let me purchase some leaves from their plants. They suggested Brandywine tomato leaves since they have a nice-looking shape, and I was thrilled to take them home and turn them into pesto. I also took home several of their tomatoes to serve with the pesto. I am capable of growing some herbs, and I do have a few pots with basil plants. This pesto is made with a mix of basil leaves and tomato leaves. 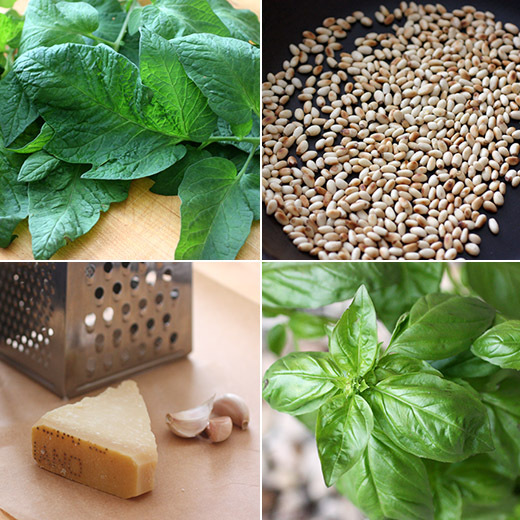 The rest of the ingredients are the usual suspects in traditional pesto. Pine nuts were toasted, Parmigiano Reggiano was grated, garlic was peeled and chopped, and extra virgin olive oil was ready to be added. Everything was pulsed in a food processor. 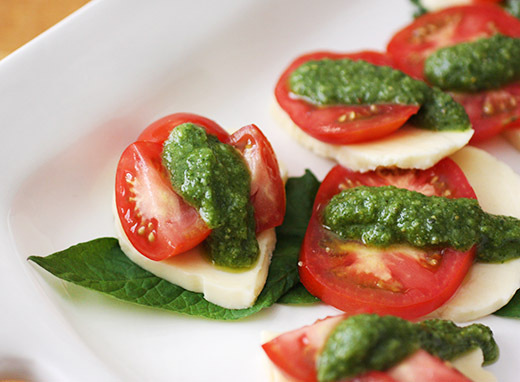 I liked the suggestion in the book of using this pesto in a take on Caprese salad. I sliced some fresh mozzarella from Full Quiver, topped the cheese with fresh tomatoes, and spooned the pesto over them. I had a few extra tomato leaves to use to decorate the platter. As usual, Kurt was suspicious of this new spin on a classic recipe. He wasn’t sure the tomato leaves would be a welcome ingredient in pesto. All concerns were forgotten when he tasted it though. The flavor is like a traditional basil pesto with an added, herby dimension. It was fresh and delicious as part of a Caprese. If I ever attempt to grow tomatoes again, now I know I can at least eat the leaves if no fruit appears on the vines. And, I have lots of new ideas for other plants too. Speaking of tomato season, I've been helping plan a Tomato Dinner to be held at Springdale Farm this Tuesday, June 9. The dinner will benefit Springdale Center for Urban Agriculture and Slow Food Austin. Tickets are still available. The participating chefs are planning some incredible dishes for this feast on the farm. Recipe reprinted with publisher’s permission from The CSA Cookbook . 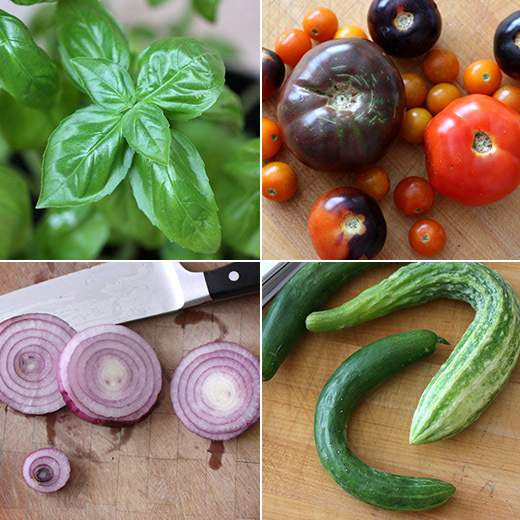 When I think of summer bounties, I think of basil and tomatoes—the poster children for the season. Something about the sweet, savory, and ever-so-slightly peppery aroma of basil makes a fruity, subtly smoky, vine-ripened tomato sing. When you combine both of their characteristics into an otherwise traditional pesto, the result is a sauce that is unmistakably basil-scented, but with a note of warm and earthy tomato leaf. 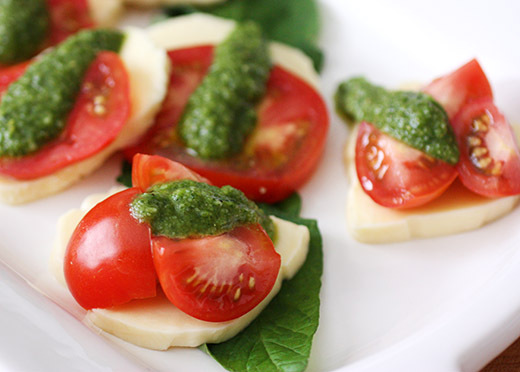 Slather it on a thick slice of mozzarella for a different take on the classic Caprese salad. Add the basil, Parmesan, tomato leaves, pine nuts, garlic, and salt to a food processor and pulse until crumbly, scraping down the sides of the bowl with a rubber spatula as needed. Continue pulsing and add the oil in a steady stream until well blended. 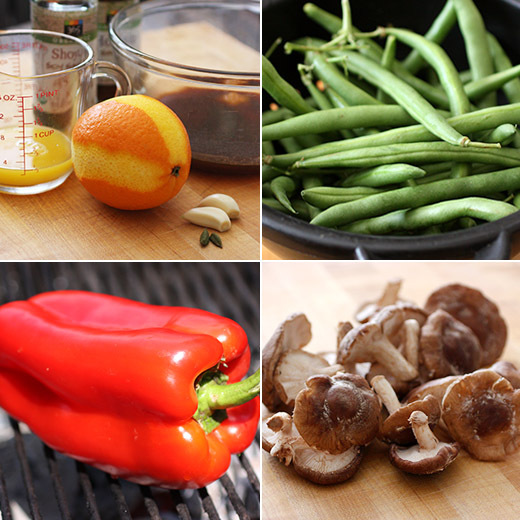 Use 1/4 cup oil for a thicker paste or up to 1/2 cup oil for a thinner sauce.